The race weekend at UC Santa Barbara began with a windy 56 mile road race in Sisquoc. The women’s A field had the largest field yet, with the majority from Stanford and UC San Diego. The first of four laps was at a moderate pace with everyone still warming up their legs, but the pace quickened soon after the first lap. On the second lap, UCSD attacked but it was quickly covered. Right away, CSU Channel Islands counterattacked but was caught as well in a good effort by Stanford. Then, Stanford attacked, but the field came back together before the start of the climb. In the climb, Stanford and CSU Channel Islands pushed the pace causing the field to break into three separate groups. The first consisting of six riders: two from Stanford, two from UCSD, one from UCLA, and one from CSU Channel Islands. The second group was all Stanford, and the third group consisted of four riders: one from UC Davis, one from UC Santa Barbara, and two from UCSD. The race continued in these three packs for the remaining two laps as the wind began to pick up. The finish was a field sprint in the front group with Claire (UCLA) taking first, Taylor (Stanford) taking second, and Esther (UC San Diego) taking third. Alex and Jake work together in the breakaway to catch the field (Photo Credit: Vincent Chiu). Sunday was in Goleta, and once again there was a great turnout from many schools for the women’s A race making for a fast and fun crit. The race didn’t begin until the second lap where attacks arose between Stanford and UCSD who both made up the majority of the field. This continued throughout the race and both teams did a great job covering each other’s attacks each and every time. With six primes throughout the race the pace would quicken and drop many times. No breaks held, and with two laps to go the pace began to quicken rapidly. There were two lines of riders in the final lap, one consisting of UCSD, UC Davis, and UCLA and the other consisting of Stanford riders. At the finish Sarah (UC Davis) took first, Esther (UCSD) took second, and Taylor (Stanford) took third. pulled further away from the field with each lap they completed. 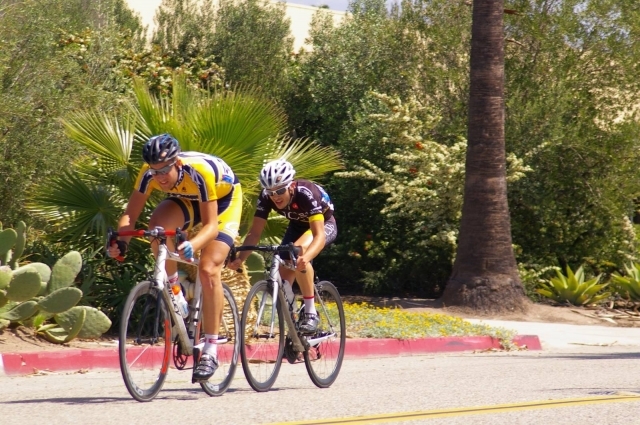 A pack of five riders consisting of teams from UCLA, USC, UCSB, and UCSD also broke away from the peleton and put in a tremendous effort to catch the front two leaders but were unsuccessful. As the race progressed around the .6 mile course, Freund and Cohen closed in on the pack and with the race almost over, they lapped the field. Daniel Kosykh also attempted to catch the group of five riders but was out on the course solo and never made it up to the chase group. Once the peleton was lapped, Connor Benton of UC Berkeley took some hard pulls to try to keep his teammate ahead of the chase group. Cody O'Reilly from UCSB won the field sprint earning him 8th place while first place was won by Alex Freund, with Ben Bertiger in second, and John Tomlinson in third. With conference championships coming up it will be interesting to see who will take home the blue leader's jersey in the end. Afterwards everyone had a great time collecting Easter eggs the UC Santa Barbara team had hidden making for a great end to the weekend.